The Minnesota Wild came into this one on the second half of a back-to-back, so it was fair to expect some tired legs for at least part of the game. The Bruins came in winners of their last four games. The Kuraly line started for the Bruins, opposed by the Koivu line for Minnesota. Minnesota’s sluggishness due to the quick turnaround showed early on. After a back-and-forth start, Danton Heinen redirected John Moore’s shot from the point past Stalock and in to give the Bruins the early lead just 5:23 into the period. Heinen’s goal marked his fifth of the year, assisted by Moore (6), and Krug (23). Not too long after, Zdeno Chara somehow tossed the 6-foot-6, sub 200 pound Minnesota winger Jordan Greenway like a sack of potatoes and took an interference penalty – giving Minnesota an opportunity to even things up. One may think it’s hard to do that to someone as big as Greenway, but sometimes being 6-foot-9 like Chara comes in handy. The penalty was successfully killed off by the Bruins. John Moore stayed amongst the offense when he kept the puck in along the wall to the point where the puck found Patrice Bergeron for an indirect pass, and then the backboards where it was deposited into the net by Brad Marchand. The goal marked Marchand’s 16th of the year, Moore’s seventh assist of the season and second of the game, and Patrice Bergeron’s 23rd assist. 2-0 Bruins with 8:31 to go. Brad Marchand makes it a 2-0 game. Tuukka Rask preserved the two-goal lead with an excellent save on Eric Staal with speed. Shortly after that, Kevan Miller went to the box for holding. With 34 seconds left on the Wild power play, Staal made it 4-on-4 when he went off for tripping Rask. The Bruins continued the offensive trend when Bergeron sent a shot wide, where it was intentionally deflected off Jake DeBrusk’s chest and in, 3-0 Bruins with 45 seconds left in the period. The goal marked DeBrusk’s 14th of the season, Bergeron’s second assist of the game and 24th of the season, and Brad Marchand’s 30th assist. In a dominant, highlight-filled first period for the Bruins, they outshot the Wild 15-6. Momentum was clearly in their favor heading into the second period. Rask was nearly fooled on a redirect by Luke Kunin that nearly found its way through his five-hole, but no dice for Kunin and the Wild. The start of this one was very similar to that of the first period. After that chance, went off for two minutes thanks to a tripping penalty for Zach Parise. The dominance continued when Bergeron got on the board early in the power play off of a redirection off of his skate. It was 4-0 Bruins thanks to Bergeron’s 14th goal of the season, assisted by Marchand (31), and Krug (24), both their second assists of the game. Moore went to the box around the halfway point of the period for burying Kunin into the Bruins net – can’t do that. Two minutes for interference for Moore, giving Minnesota a chance to get back into this one to some degree. They didn’t convert. Despite not finding the back of the net, the shots were 10-3 Minnesota 13 minutes into the period, so the first period served as a wake-up call to some degree. Rask had yet another very sound period in the crease. Despite a solid period from the Wild, the advantage still remained heavily in favor of the Bruins on the scoreboard. The shots were 12-5 Wild, decreasing the shot margin to just 20-18 in favor of the Bruins. The game got progressively quieter after the first period. Not even an empty-netter, just the cap on a 24-save shutout for Rask. The Bruins dominated most of the game and the scoreboard shows it. The shots in the final frame were 7-6 Bruins and 27-24 overall. That emphatic win makes it five straight for the Bruins. Next up are the Washington Capitals at TD Garden at 7 PM ET on Thursday. 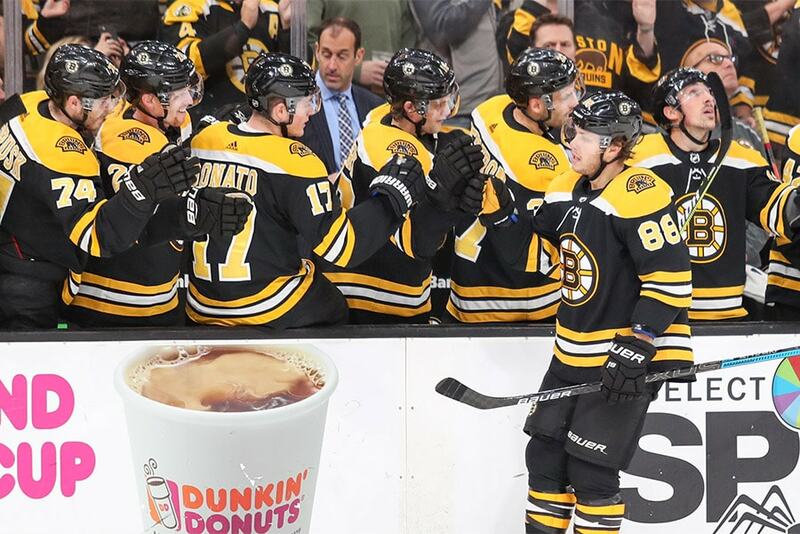 Check out the available tickets from our advertising partner SeatGaint for your next Boston Bruins game. Click the link below, and when purchasing any event ticket, from the NHL, NBA, MLB, NFL to concerts and shows, please use discount code BNGP to save a little money. Thank You!